With a population of 119,045 in 2017, it is the eighth most populous city in the state. 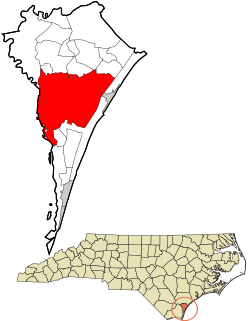 Wilmington is the principal city of the Wilmington Metropolitan Statistical Area, a metropolitan area that includes New Hanover and Pender counties in southeastern North Carolina,  which has a population of 263,429 as of the 2012 Census Estimate. Wilmington was settled by the English along the Cape Fear River. The city was named after Spencer Compton who was the Earl of Wilmington. Its historic downtown has a 1.75-mile (2.82 km) Riverwalk,  developed as a tourist attraction in the late 20th century. In 2014 Wilmington's riverfront was ranked as the "Best American Riverfront" by readers of USA Today. It is minutes away from nearby beaches. 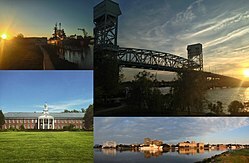 The National Trust for Historic Preservation selected Wilmington as one of its 2008 Dozen Distinctive Destinations. City residents live between the river and the ocean, with four nearby beach communities: Fort Fisher, Wrightsville Beach, Carolina Beach and Kure Beach, all within half-hour drives from downtown Wilmington. In 2003 the city was designated by the US Congress as a "Coast Guard City". It is the home port for the USCGC Diligence, a United States Coast Guard medium endurance cutter. The World War II battleship USS North Carolina is held as a war memorial; moored across from the downtown port area, the ship is open to public tours. Other attractions include the Cape Fear Museum, and the Wilmington Hammerheads United Soccer Leagues soccer team. The University of North Carolina Wilmington (UNCW) provides a wide variety of programs for undergraduates, graduate students, and adult learners, in addition to cultural and sports events open to the community. 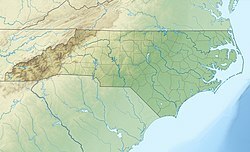 Some early settlers of Wilmington came from the Albemarle and Pamlico regions, as well as from the colonies of Virginia and South Carolina, but most new settlers migrated from the northern British colonies, the West Indies, and the British Isles. Many of the early settlers were indentured servants, recruited mainly from the British Isles and northern Europe. As the indentured servants gained their freedom and fewer could be persuaded to leave England because of improving conditions there, the colonists imported an increasing number of African slaves to satisfy the labor demand. By 1767, slaves accounted for more than 62% of the population of the Lower Cape Fear region. Many worked in the port as laborers, and some in ship-related trades. By mid-century, the churchyard of St. James Episcopal Church and other town cemeteries had become filled with graves. On November 16, 1853, a group of citizens, organized as "The Proprietors of the Wilmington Cemetery," was formed to develop a new cemetery. Sixty-five acres of land around Burnt Mill Creek was chosen as the site for what would be called Oakdale Cemetery. It was the first rural cemetery in North Carolina. The cemetery's first interment, on February 6, 1855, was six-year-old Annie deRosset. Many remains from St. James churchyard were relocated to the new cemetery. Wilmington had a black majority population before the Civil War. 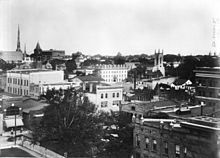 While most were slaves, the city had a significant community of free people of color, who developed businesses and trades. For a period up to Nat Turner's Rebellion, they had been allowed to vote, carry arms and serve in the militia. Fears after the rebellion resulted in the state legislature passing laws to restrict the rights of free blacks. 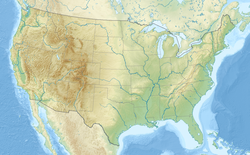 Wilmington is located at 34°13′24″N 77°54′44″W﻿ / ﻿34.22333°N 77.91222°W﻿ / 34.22333; -77.91222. It is the eastern terminus of Interstate 40, an east-west freeway that ends 2,554 miles away at Barstow, California, where it joins I-15, the Gateway to Southern California. This road passes through many major cities and state capitals along the way. According to 2013 census estimates,  there were 112,067 people and 47,003 households in the city. The population density was 2,067.8 people per square mile (714.2/km²)and there were 53,400 housing units. The racial composition of the city was: 73.5% White, 19.9% Black or African American, 6.1% Hispanic or Latino American, 1.2% Asian American, 0.5% Native American, 0.1% Native Hawaiian or other Pacific Islander. The Wilmington International Airport (ILM) serves the area with commercial air service provided by American Airlines, Delta Air Lines, and United Airlines. American Airlines carries a large share of the airport's traffic, and therefore flies the largest of the aircraft in and out of the airport. The airport serves over 930,000 travelers per year. The airport is also home to two fixed-base operations (FBO's) which currently house over 100 private aircraft. The airport maintains a separate International Terminal providing a full service Federal Inspection Station to clear international flights. This includes U.S. Customs and Border Protection, U.S. Dept of Agriculture and the U.S. Dept of Immigration. The airport is 4 miles from downtown and is served by Wave Transit buses. Public transit in the area is provided by the Cape Fear Public Transportation Authority,  which operates fixed bus routes, shuttles, and a free downtown trolley under the brand name Wave Transit. A daily intercity bus service to Raleigh is provided by Greyhound Lines. Wilmington is also served by Amtrak Thruway bus connections to Wilson, NC. The City of Wilmington offers transient docking facilities  in the center of Downtown Wilmington along the Cape Fear River approximately 12.5 miles (20 km) from the Intracoastal Waterway. The river depth in the run up from the ICW is in excess of 40 feet (12 m). Taxicab service is available from several vendors, however, as the price of fuel rises, yet the City's Taxi Commission keeps meter rates artificially low, there is a real likelihood that no drivers will continue to work, as their income, before taxes, now averages 30% of what it was in 1998. The Gary Shell Cross-City Trail is primarily a multi-use trail which provides bicycle and pedestrian access to numerous recreational, cultural and educational destinations in Wilmington. The Gary Shell Cross-City Trail provides bicycle and pedestrian connection from Wade Park, Halyburton Park and Empie Park to the Heide-Trask Drawbridge at the Intracoastal Waterway. It also connects to the River to Sea Bikeway and the under construction Central College Trail and Greenville Loop Trail. The Hannah Block Historic USO/Community Arts Center,  120 S. Second Street in historic downtown Wilmington, is a multiuse facility owned by the City of Wilmington and managed by the Thalian Association,  the Official Community Theater of North Carolina. Here, five studios are available to nonprofit organizations for theatrical performances, rehearsals, musicals, recitals and art classes. For more than half a century, the Hannah Block Historic USO Building has facilitated the coming together of generations, providing children with programs that challenge them creatively, and enhance the quality of life for residents throughout the region. The Hannah Block Second Street Stage is home to the Thalian Association Children's Theater. It is one of the main attractions at the Hannah Block Community Arts Center. The theater seats 200 and is used as a performance venue by community theater groups and other entertainment productions. Since 1995, Wilmington hosts an annual, nationally recognized, independent film festival called "Cucalorus." It is the keystone event of The Cucalorus Film Foundation, a non-profit organization. The Foundation also sponsors weekly screenings, several short documentary projects, and the annual Kids Festival, with hands on film-making workshops. The Wilmington Symphony Orchestra was established in 1971 and offers throughout the year a series of five classical performances, and a Free Family Concert. Wilmington is also home to numerous music festivals. The Second and Orange Street USO Club was erected by the Army Corps of Engineers at a cost of $80,000. Along with an identical structure on Nixon Street for African-American servicemen, it opened in December 1941, the same month that the Japanese attacked Pearl Harbor. From 1941 to 1945, the USO hosted 35,000 uniformed visitors a week. Recently renovated with sensitivity to its historic character, the Hannah Block Historic USO (HBHUSO) lobby serves as a museum where World War II memorabilia and other artifacts are displayed. The building itself was rededicated in Ms. Block's name in 2006 and restored to its 1943 wartime character in 2008. The building is listed in the National Register of Historic Places. The World War II Wilmington Home Front Heritage Coalition,  an all volunteer 501(c)(3) preservation organization, is the de facto preservationist of the building's history and maintains the home front museum. The Star-News is Wilmington's daily newspaper; read widely throughout the Lower Cape Fear region and now owned by GateHouse Media. A daily online newspaper, Port City Daily ( portcitydaily.com), is owned by Local Voice Media. Two historically black newspapers are distributed and published weekly: The Wilmington Journal and The Challenger Newspapers. Encore Magazine is a weekly arts and entertainment publication. WTMV, Channel (29), ( Antenna TV) : licensed to Ogden, owned by Tutt Media Group Inc.
^ Official snowfall records for Wilmington were kept at the Weather Bureau in downtown from December 1870 to September 1951, and at Wilmington Int'l since October 1951. Precipitation, minimum temperature, and maximum temperature records date to 1 January 1871, 1 March 1873, and 1 April 1874 respectively. For more information, see ThreadEx.